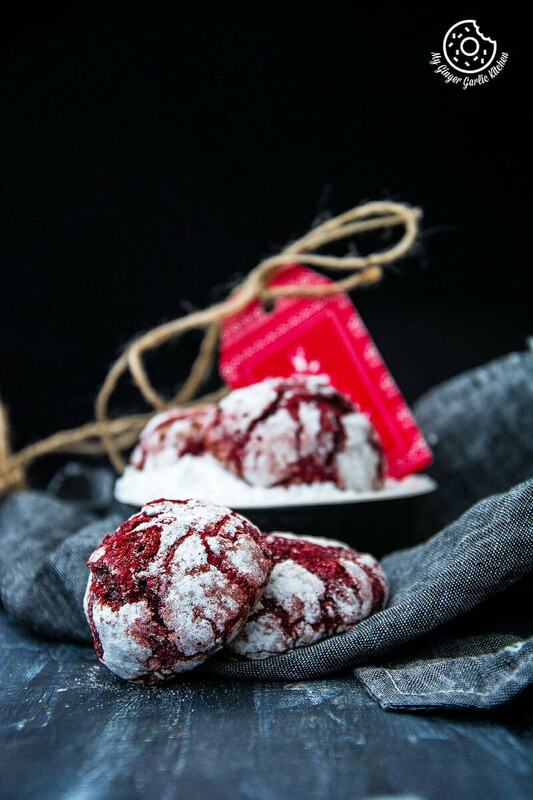 Red Velvet Crinkle Cookies are ideal Christmas cookies! 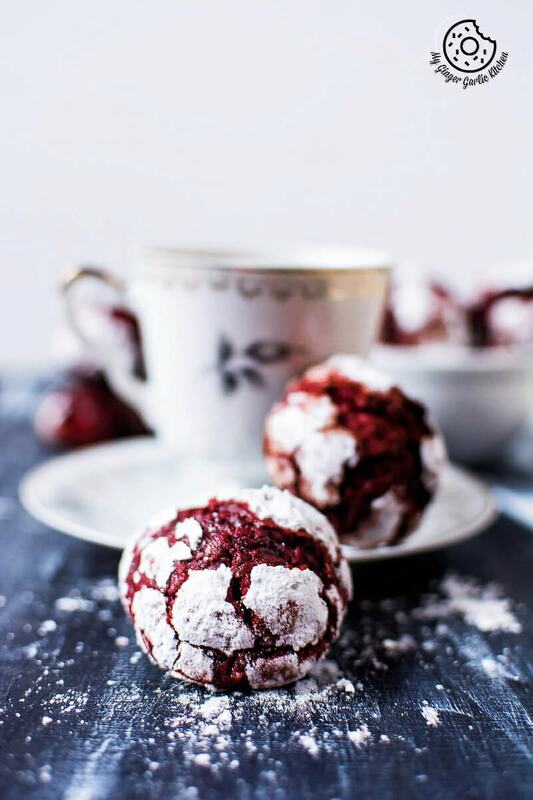 These cakey Red Velvet Crinkle Cookies are stunning, chewy, velvety, delicious, and festive — what else can we ask for a Christmas cookie? They are simply ultimate. 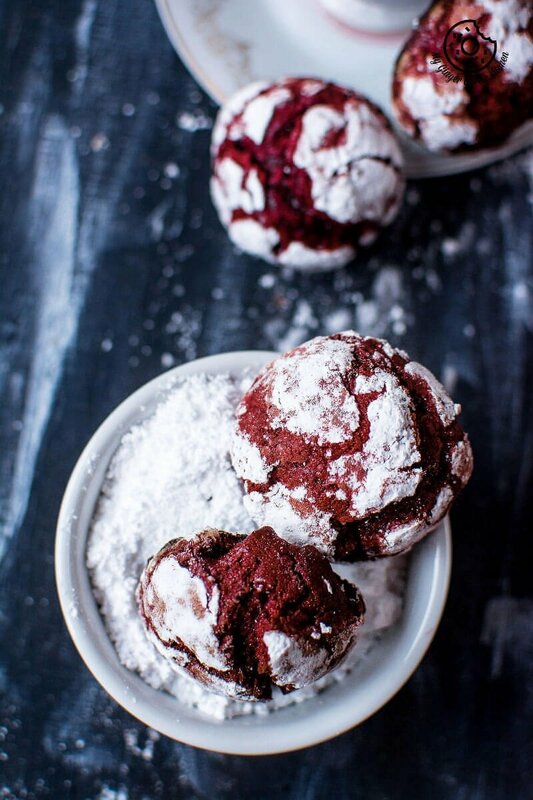 You simply roll the red velvet cookie dough in powdered sugar before baking, and you get the most delicious and chewy cookies with stunning white crinkles on top. 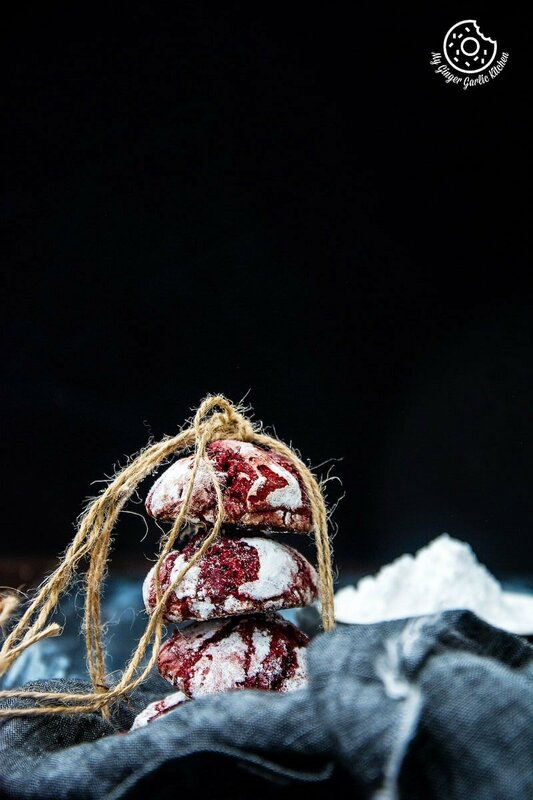 A deep red cookie with a sophisticated crackled crust dusted with powdered sugar is just AH-MAZING! Wishing you all a very happy penultimate Saturday of this year. Hope you all are as excited for Christmas and New year as I am. New year = new beginning = new adventure = new challenges. All in all, it totally means a new kinda fun. I know we all are really busy during the last days of this year and you have so much stuff to plan and so many things to do. Thus, you don’t have time to read much. 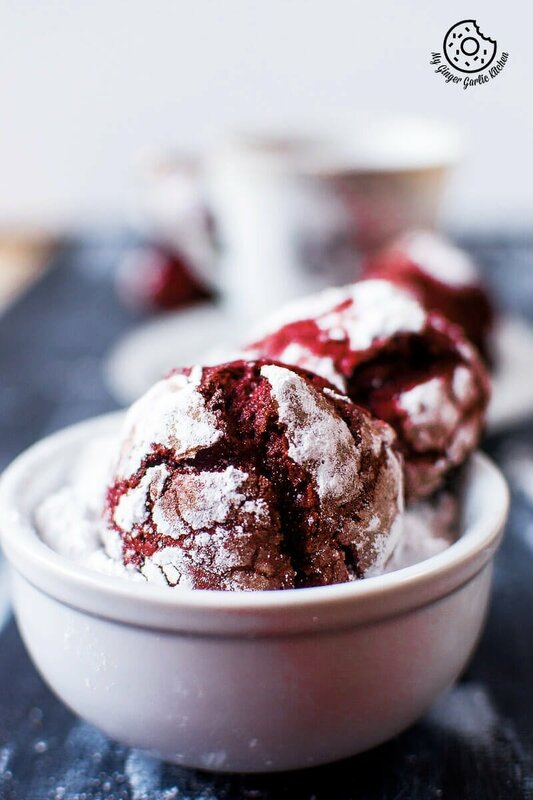 So without wasting any time, let’s jump straight to the Red Velvet Crinkle Cookies which I am sharing today. The one thing which I love the most about crinkle cookies other than the taste is the presence of those delicate cracks on top. Every time I see crinkle cookie I get mesmerized by its beauty. 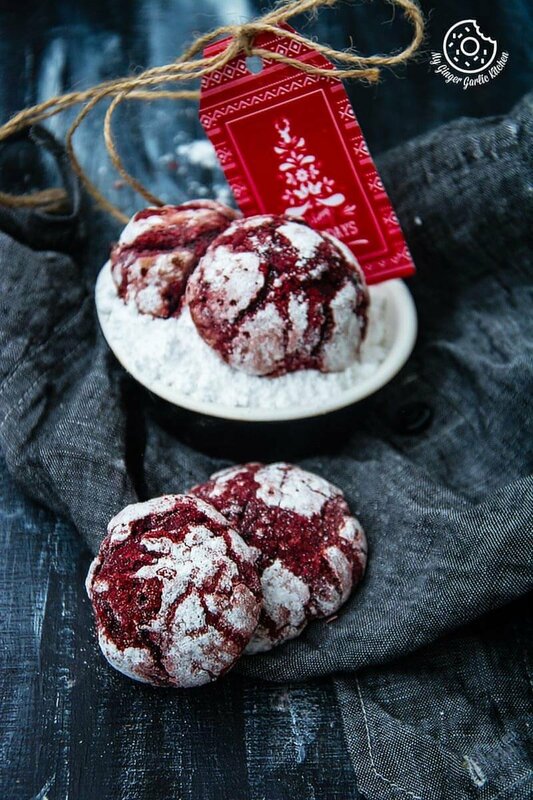 Why are the red velvet crinkle cookies in demand for this winter festive season? 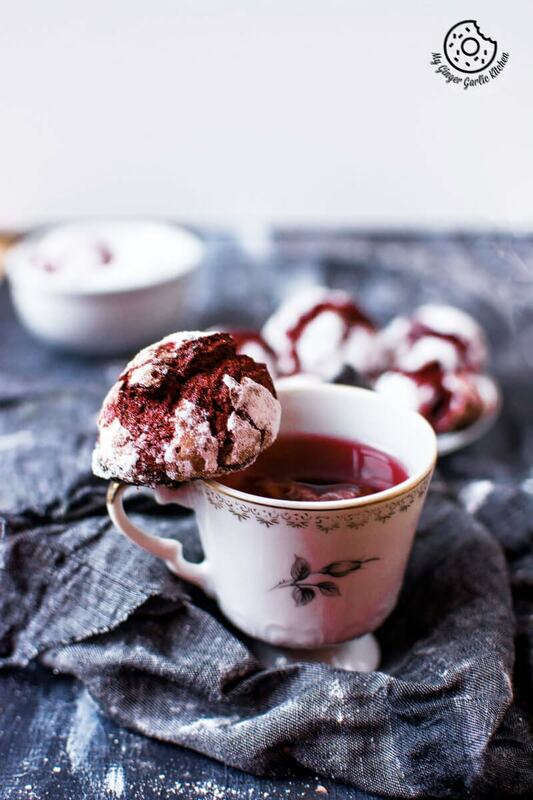 Because they are beautiful, they are deep red, they are velvety and they look like the red velvet is covered in snow. Plus, this is a cold season and they go so well with some hot chocolate, a warm glass of milk or some herbal tea. 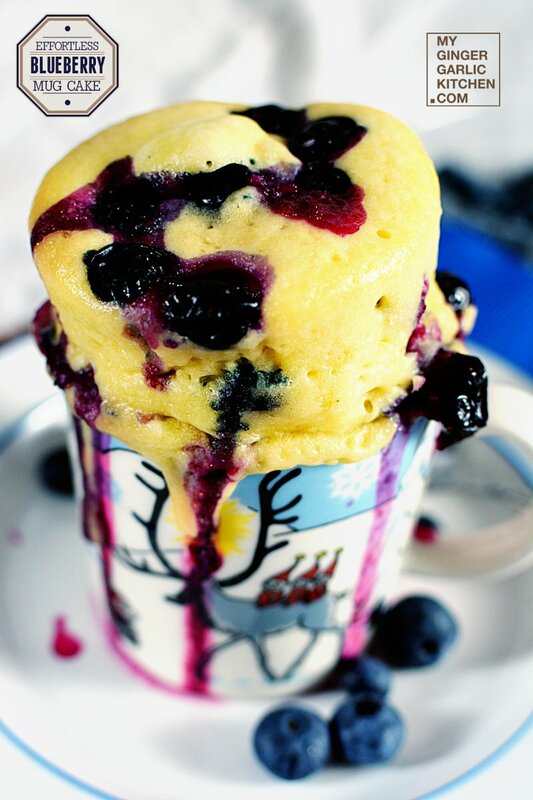 These muffin-like cookies are holiday brunch perfection. Well, I am not the only one and certainly not the first one to share red velvet crinkle cookies. 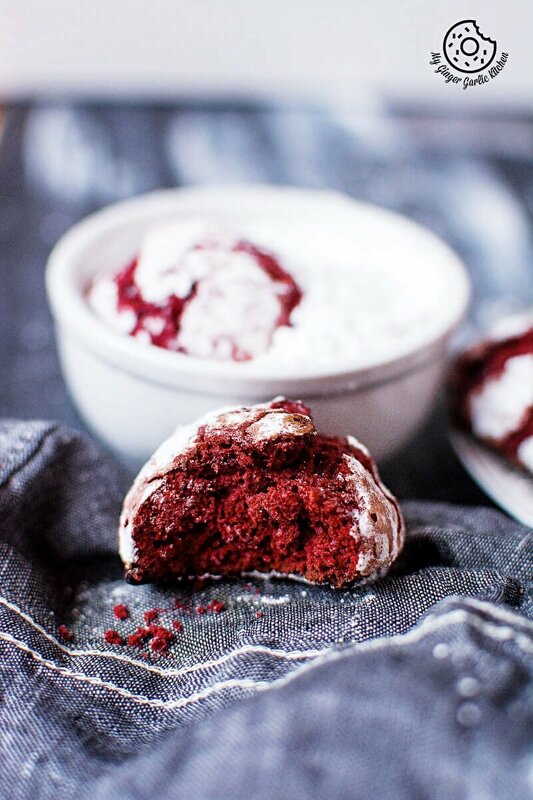 The internet is flooded with so many stunning and mouth-watering red velvet crinkle cookie recipes. But the one I am sharing today is my tried and tested recipe which I have been baking over the past few years and everytime they work just great. So I consider this to be my humble duty to tell you a little about their goodness. The good news is that they don’t require any cake mix. 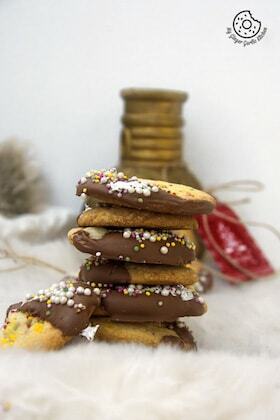 Some basic cookie ingredients which you always have in the kitchen would do well. The finalized cookies taste somewhere in between a chocolate cookie and a muffin. The outer layer is sweet and crisp and the inner layer is soft. Making them is super-easy and they really look very festive. In short, they are exemplary muffin-like cookies. Do you want any more reasons to have them? They are not really huge in size — perfectly bite-sized for kids to grab. 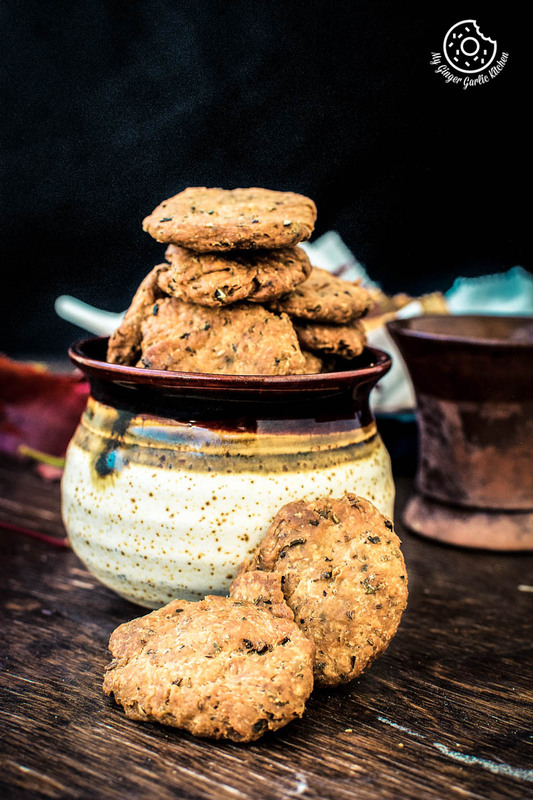 They will also make a nice Christmas gift and I have already made some gift-packs full of these cookies. I hope my friends would love them as much as my family does. When I made those gift wraps, Adoria asked, why am I wrapping cookies. 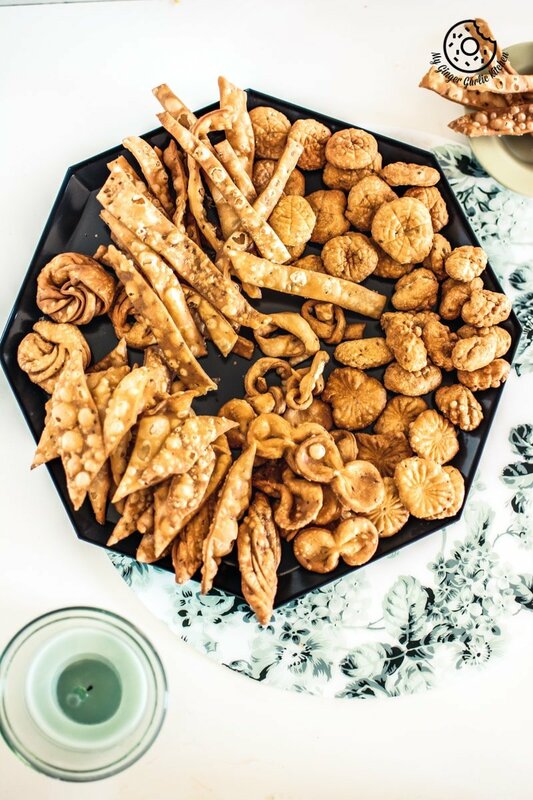 I then told her that they are Christmas gifts and that made her so enthralled by the fact that these cookies can also be gifted. She said: “Yes, mommy. I want to gift them like you are gifting to your friends. All of my friends would be so happy when I’ll give them these cookies. So we baked another batch just to give them to her friends. And after baking, she made sure that I also make few pretty packets full of Red Velvet Crinkle Cookies for Christmas giveaway to her friends. That’s how these kids learn, they watch what you do and then they replicate. They are stunning, velvety, delicious, crispy and festive — what else can we ask for a Christmas cookie? They are simply ultimate. So let’s bake them to enjoy ourselves or to gift them. 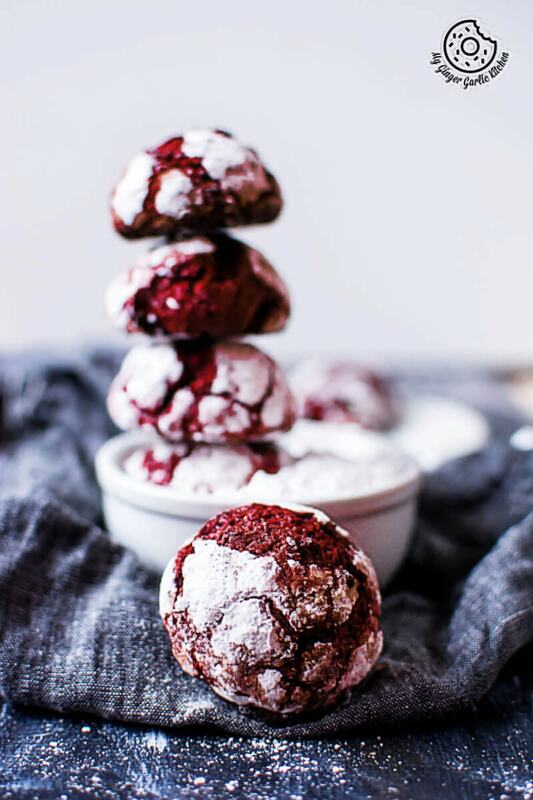 Red Velvet Crinkle Cookies are stunning, velvety, delicious, crispy and festive — what else can we ask for a Christmas cookie? They are simply ultimate. 1. In a mixing bowl, sift together the flour, sugar, cocoa powder, salt, baking powder and keep it aside. 2. In another large mixing bowl add butter, eggs, and cream together. 3. Add dry ingredients and whisk well to combine. 4. Add red food color and mix well. Add more color until the dough is bright in the red color. 5. Wrap the bowl and chill in the refrigerator for 4-5 hours. 6. Preheat your oven to 175°C/350°F. 7. Line a baking tray with parchment paper and set aside. 8. Shape into about 18-20 small balls using a melon baller or a teaspoon. 9. Roll balls into the confectioner sugar, and arrange them on a baking tray. 10. Bake for 11-12 minutes or until cookies beautifully puffed. 11. Allow them to cool for 2 minutes. 12. Transfer to wire racks and cool completely. Enjoy! You can also add white or brown chocolate chips for more chocolaty flavor.